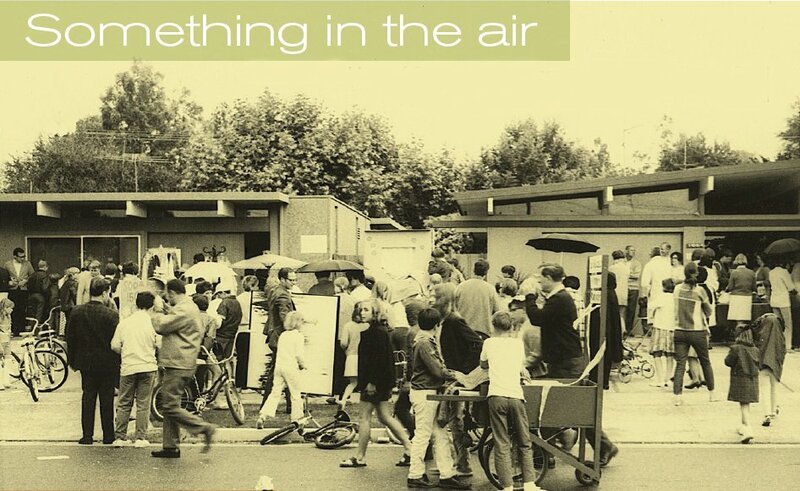 Born in the San Jose Eichler tract of Fairglen in 1962, the Fairglen Art Festival carried on for the next 33 years. Carol Sveilich and her family were there at the start, when a seed was planted in their Eichler cul-de-sac in the form of a low-key neighborly art share dubbed 'Art in Our Alley.' In short time, the event mushroomed into a high-spirited annual festival, eventually drawing thousands of visitors from around the Bay Area. As Carol fondly looks back at her childhood in Fairglen and the festival's humble beginnings, she is accompanied here by more than two dozen precious photographs that have survived the past five decades, many of them shot by her dad Joe. During the Fairglen Art Festival of 1969, surprise summer rain hit, but the festival carried on. 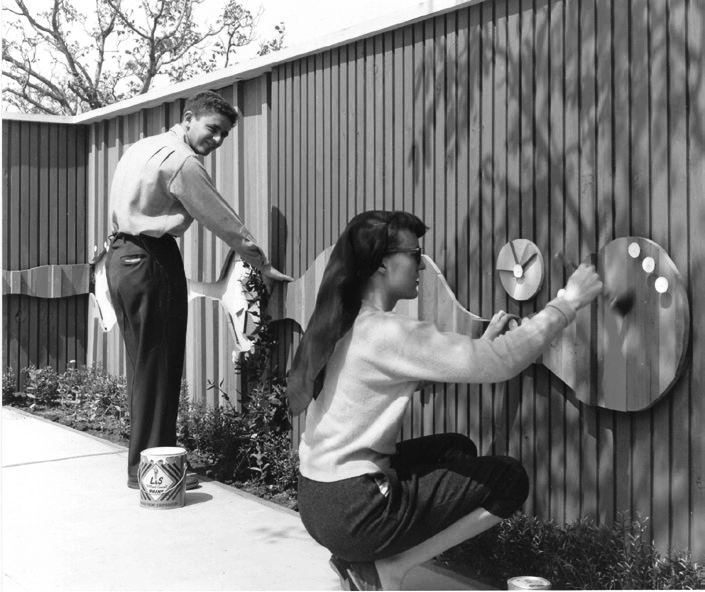 Fairglen's festival may have been inspired by 'Art About the House,' a 1954 event staged by Eichler Homes at a Palo Alto Eichler that was featured in Life magazine. Here, event organizer, Stanford professor, and Eichler Homes design consultant Matt Kahn (left) mounts art on a fence in preparation for AATH. 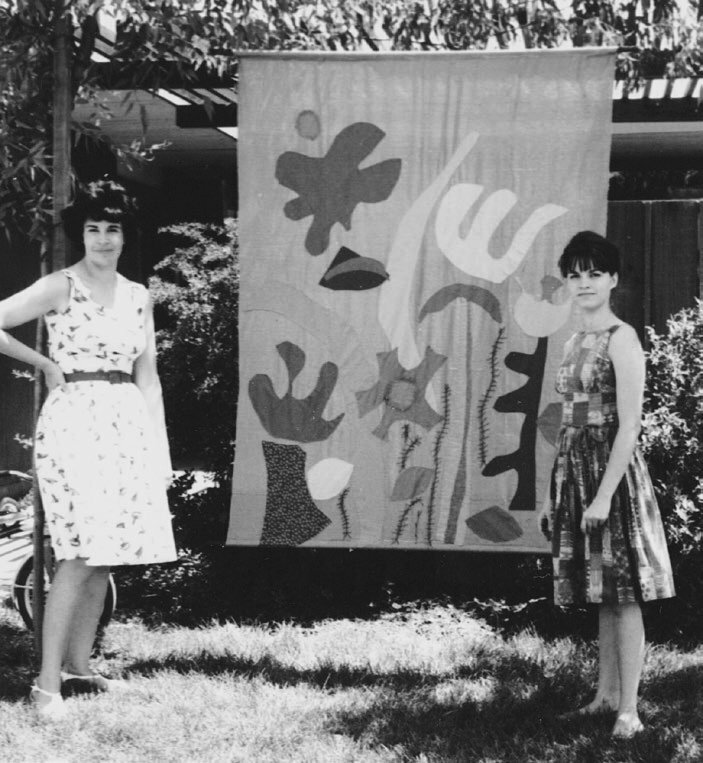 Locals Blossom Sveilich (Carol's mom) and Marge Lambson (Les' wife) stand with a tapestry for Art in Our Alley, 1963. Santa Clara Valley was wall-to-wall cherry and apricot orchards in the mid-1950s—and San Jose's Willow Glen was its sweet spot, a fragrant oasis of blooming blossoms and pungent agriculture. Soon the bulldozers arrived—and my family moved into one of the brand-new Eichler neighborhoods that sprouted on the tread marks. My San Jose childhood home was on Fairgrove Court, in Fairglen, a unique tract of more then 300 Eichler homes, built between 1957 and 1962, within the umbrella neighborhood of Willow Glen. The ten homes in my U-shaped cul-de-sac circled like covered wagons, chock-full of nuts, drama, wild parties, babysitting co-ops, infidelity, and artistic zeal. An intriguing cast of characters—authors, artists, philosophers, musicians, politicians, professors, and architects—became my neighbors. Everyone seemed to know everyone else in this neighborhood overflowing with camaraderie, creativity, and lots of children, who would routinely abandon their bicycles on driveways each night at dinnertime. Neighbors didn't schedule their visits—they dropped in and shared juicy gossip or a fevered political outburst over coffee or cocktails. The families around us celebrated with block parties in the summer, Christmas caroling in the winter, and garden parties and evening shindigs all year 'round. Modern living in the 1960s was trendy, yet easily attainable and certainly affordable. My family moved into Fairglen in 1960, when a new home could be had for $19,000. Eichler homes, with their lush central atriums, were a Space-Age suburban oasis. Joe Eichler and his architects designed and built homes like no others; they zigged where other homes zagged, and each dwelling had a distinct and irreplaceable soul.